This lemon bundt cake with glaze is an ode-to-lemon in cake form. 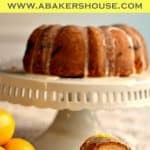 Lemon juice, lemon zest, lemon curd, and a lemon glaze create a bright, lemony bite in this lemon bundt cake recipe. This lemon bundt cake with glaze will brighten up a cold winter’s afternoon as it is perfect with a cup of tea. The original recipe is a sour cream-lemon pound cake from Cooking Light. I added a touch of lemon curd into the batter then also layered the lemon curd into the cake. I wish it was more apparent that the lemon filling was in the cake but the colors of the cake and the filling are so similar that you don’t notice until you take a bite. What a nice surprise! And that glaze, yes more lemon! A lemon and powdered sugar topping seals the deal here. All this talk about lemon and you might think this cake is overwhelmingly strong. It is not. When baking with lemon it’s best to layer the flavors so that the citrus is not lost during the baking process. 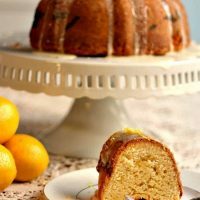 I find that you have to load up on lemon flavors for the lemon to sing in this lemon bundt cake once baked and the combination is quite pleasing. Lemon, lemon and more lemon! 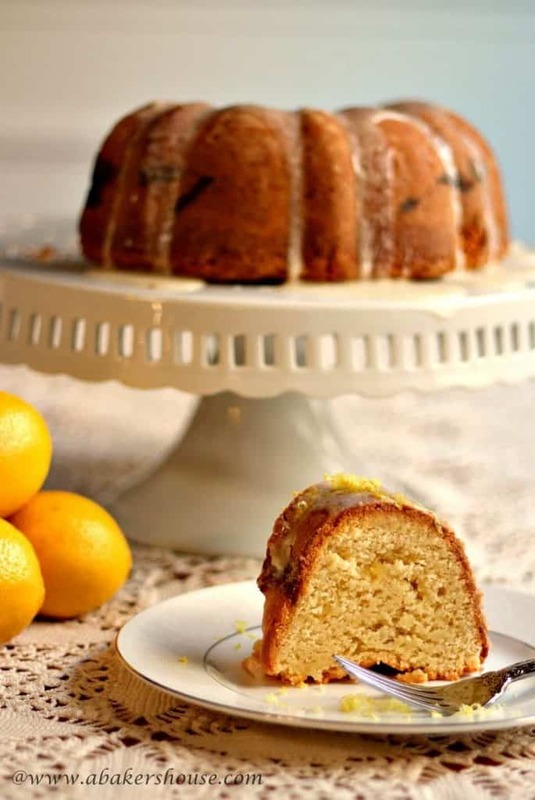 Make this cake and share your love of lemon! Spray Bundt pan with baking spray and dust with flour. Combine the dry ingredients: flour, baking soda, and salt. Stir with a fork or whisk. Using a mixer (hand held or stand mixer) beat the butter for 2-3 minutes, until it lightens in color and texture. Slowly add the sugar, then the eggs, Next add the lemon zest, lemon curd and lemon juice. Blend well. Add the flour mixture and the sour cream in stages, alternating and mixing at low speed as you go. My hand-held mixer was not strong enough to mix on low towards the end of mixing this batter so I switched to a wooden spoon. The batter will be thick. Put half of the batter into the pan and spread it around with a spatula. You can spoon the lemon curd filling around the batter but I like putting it in a ziploc bag, cutting the corner off and piping the filling around in the center of the batter. Avoid the edges so that the curd stays within the cake. Bake for 1 hour, add an extra ten minutes if necessary. Cool for ten minutes in the pan then invert the pan and remove the cake. Once the cake is cooled,whisk together the glaze of 1 Tb lemon juice and 1/2 cup powdered sugar and pour over the cake. Recipe adapted from a Cooking Light recipe. 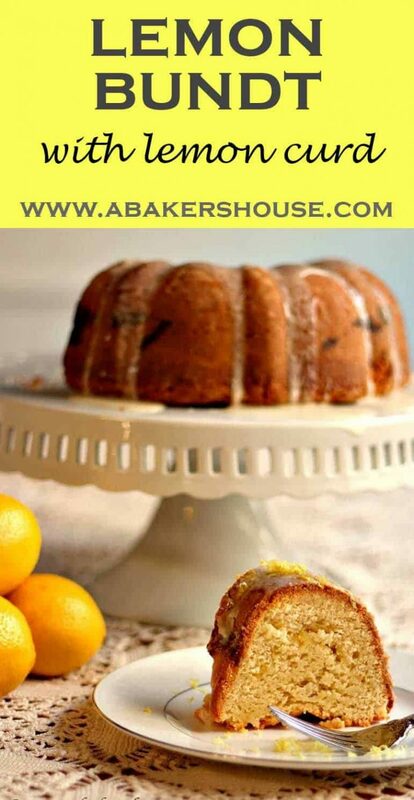 Please note that A Baker’s House, is a participant in the Amazon Services LLC Associates Program, an affiliate advertising program designed to provide a means for us to earn fees by linking to Amazon.com and affiliated sites. Thanks so much! Yes, I wish I still had some left to enjoy with tea today. I guess it is time to make another Bundt!! Thanks again for organizing us all! Oh fun! I like that it is a surprise to bite into the filling you can’t tell is there for an extra pop of flavor. I like that thought– that it is a fun surprise to find more lemon flavor in the lemon curd filling. Thanks, Renee! Your photo is just beautiful. Love the sounds of this recipe, and this comes just when I needed something to brighten up my mood. Thanks, Karen, hope your day brightened as it went today. Thanks for your comment! Loving the triple lemon!! I’m a huge lemon fan so this would be right up my alley. And oh that curd must have been so good in there! I adore lemon curd. I’ll just go grab my fork. Be right over cause I need to have a bite (or 2 or 3) of this! Yes– come on over! Wouldn’t that be fun!! Yum! I wish I have the patience and time to bake. I want to bake more but everytime I attempt to do so, I get sidetract by other things. Neighbors who like my baking are my favorite neighbors to have! I love sharing plus I know that I don’t need to eat the WHOLE cake myself! Thanks for reading. Yes, the lemon curd makes this a special cake! Thanks for your comment! I am totally drooling with this cake. It looks so lovely!! You are sweet, Tara! Thanks so much! I love the addition of lemon curd in this!!! I will definitely have to try this one! Thank you for sharing, your bundt looks lovely!! did you also top it with lemon zest? Thanks, Alice! You are right, I topped it with lemon zest at the last minute before serving. It was a nice spark of lemon flavor on top! 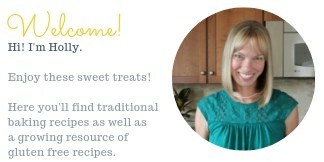 Thanks, Paula, I like lemon curd too. I want to try cranberry or raspberry curd next. So glad you like this cake, I loved this theme of baking with citrus this month. Lemon is one of my favorite flavors. Anything with lemon curd inside has my vote! Gorgeous cake, Holly! Oh, Holly! Lemon curd is my absolute favorite. I’m sure I’d love this cake! No such thing as too strong of lemon. Ever. And I love the addition of lemon curd. Thank you for reminding me that I didn’t get my bundt pan for Christmas. I must go shopping. Beautiful cake Holly. Sounds delicious and really nice photo. I adore lemon curd. I wish others in my family liked it more. I am going to make this cake asap and I am going to end up eating most of it myself 🙂 Thanks for the delicious recipe! Thanks, Julie! your note is a bright spot in my day, thanks a lot!! This looks fantastic! So bright and cheerful and I LOVE that you adapted a Cooking Light recipe. Thanks so much, yes, I love Cooking Light recipes! It was my first cooking magazine years ago when I moved into an apartment and it has followed me to every home I’ve lived in. That reminds me, it’s time to renew my subscription, thanks! Made this for my son’s birthday and it was a BIG hit! It was like a lemon pound cake with a surprise! My family are such lemon lovers they ate the leftover lemon curd with the cake! Will definitely be making this again! I am so pleased that your family enjoyed the cake! Hope your son had a happy birthday! This cake did not workout out for me. First problem was the time needed to cook. For some reason it is taking significantly longer than an hour. The top looked done and I even took it out of the pan. I found uncooked batter mixed with lemon curd dripping out of the center of the cake. The lemon curd spilled out the outside of the cake as well. It created a split in the cake that was so obvious it was ugly. I was able to slide the cake on to a cookie shee and returned it to the oven. I am still waiting to see if I can salvage it. Hi Betty, I am really sorry to hear that this cake didn’t work for you. What type of pan did you use? Maybe your oven temperature wasn’t quite right? To salvage it, perhaps you could make a trifle and layer the cake with cream and/or fruit in a deep glass trifle dish (or glass bowl). It is so disappointing when a cake doesn’t turn out, so much time and effort (and ingredients) go into baking. What a great cake for Easter brunch or a spring picnic! I will have to make this over spring break next week! Hope you enjoy this lemon filled cake!